Why Does My Acoustic Need a Neck Reset? What the hell is a neck reset and why the hell would you want one? You’ll often hear talk about neck resets (or sometimes, neck sets) but the reasons it’s required are often glossed over by saying it’s just something that acoustics need sometimes. It’s all pretty simple and it has to do with geometry (stay with me…) and wood. Let me try to make a little sense of that. Why would I need a neck reset? When an acoustic guitar is made, it is designed and constructed such that the guitar’s string height or action is round about where it should be to ensure a comfortable and buzz-free playing experience. Things are all cool for a while but, as time goes on, the wood that the guitar is made from alters very slowly. The tension of the strings (which is considerable), over the years, pulls the bridge up and, often, pushes the upper bouts of the soundboard down. Click on the image above for a closer look. This happens to pretty much all steel string acoustic guitars eventually. How quickly it occurs, and the degree to which the soundboard shifts can vary considerably due to factors like construction, timber variables and environmental variables. It can happen in a few years or in sixty years. The bellying may be severe or may be so small that it doesn’t adversely affect things. As this process occurs, the guitar’s geometry changes. 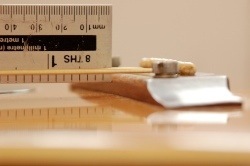 The relationship of neck/fingerboard to bridge/saddle is altered and the upshot is a higher action. 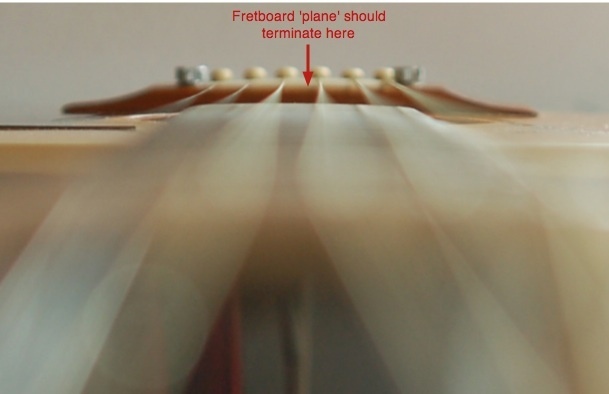 In an ideal world, a straight line along the tops of the frets should terminate around the top of the bridge. 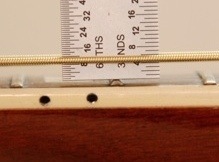 This allows a guitar’s string action be set using the height of the saddle. A good indication that a guitar is a candidate for a neck reset is when a straight-edge along the top of the frets contacts somewhere below the top of the bridge (as in this image). For a quick, visual assessment of the same thing, sight down the guitar neck from the headstock end. This will give you an idea of the neck-set situation. What you’d like to see is the frets looking like they’re hitting the top of the bridge and not, as in this image, somewhere quite a ways down it. What we often see, as guitars age, is that the saddle has been lowered again and again over the years to compensate for these changes. Most guitars are manufactured with a bit of ‘adjustment’ in mind and it’s often ok to do this for a while. In most cases, it just buys time though and eventually you run out of saddle height and can lower it no more. What is a neck reset? There are some things to consider before a neck reset is decided upon and you should talk over any alternatives with your repair guy to decide the best course of action. Sometimes the top of the bridge can be ‘shaved’ lower – there are times (not that many, admittedly) that this is the best alternative. Sometimes, the bellying of the top is not the result of the ageing process but an indication of loose braces. A neck reset is a relatively ‘invasive’ job and you and your repair tech should be sure before doing it. The neck will be removed from the body of the guitar. On most guitars currently requiring a neck set, this means a complicated process of heating the fingerboard extension to soften the glue holding it to the guitar top and then ‘steaming’ the glued-in dovetail joint to release the neck. This process is somewhat easier on some newer guitars that use ‘bolt-on’ neck systems. Many of these are still too young to need resets but it happens. Once off, wood is removed (using chisel, rasp, sandpaper, etc.) from the bottom of the heel. Doing so alters the angle at which the neck joins the body such that the fingerboard better follows the string plane (and its own plane hits the top of the bridge as explained above). How much wood is removed is generally calculated by entering some dimensions in a formula and/or by eye (experience counts for a lot). Personally, I usually end up using a combination of both – the formula to get me close and working by eye to get me exactly where I need to be. Once the wood has been removed and the angle altered, the neck is reattached. It’s not just a matter of slapping glue on it joint and hoping for the best – the newly modified geometry usually requires that the joint be adjusted and shimmed. After all that’s done, it’s sometimes necessary to either level the frets, or occasionally, to refret the neck completely. A lucky repair tech will get away without fretwork some of the time. A neck reset is a pretty big job. You need a repair guy you can trust as it’s easy to mess up. 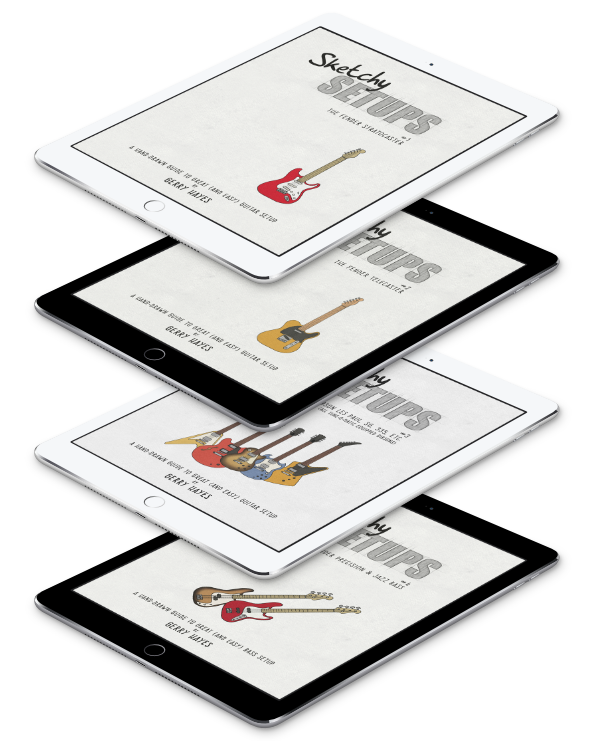 Talk through the job with your tech and satisfy yourself that you’re leaving your guitar in good hands. Prices can vary depending on the instrument as different manufacturers use different methods of attaching necks. Martin is one of the easier neck sets. Gibsons have some quirks that make life more difficult and they finish their guitars after the neck is glued on so they’re practically impossible to set without some paint chipping and touch-up work. If you’ve got a Guild, you’d best take a seat before you get a quote – some of them make for a nasty reset. So then, the long and short of it, if you’ve got an acoustic that’s worth keeping, chances are it’s going to need a neck set at least once in its life. Make sure you find a good repair guy to do the job and you’ll get an easier playing instrument for quite a while into the future. As always, shout up in the comments if you’ve any questions.